The hour is getting late, but before retiring to bed, I thought I would go ahead and post this second attempt in layering pencils of different hardnesses. I feel I’ve entered a strange new territory in the realm of art making, and am excited over the possibilities. Thanks for reading, and for all your encouragement. Imagination is the air of the mind, in which it lives and breathes. Though this day was fraught with art-related business errands, the sweetness of Thoreau’s words stayed in my heart, and when finally the evening light faded, and the business ceased, I was afforded the satisfying sweetness of curling in a comfortable chair and reading further from this young man’s pen. Waves of serener life pass over us from time to time, like flakes of sunlight over the fields in cloudy weather. In some happier moment, when more sap flows in the withered stalk of our life, Syria and India stretch away from our present as they do in history. I do recall one time when I got to know him a little better, he called me in the office one day and he says to me, “Brownie,” he said, “Can you give me your idea of what imagination is?” And I said, “No I don’t have any idea.” He said, “Well, why don’t you think about it a couple of days and come back and we’ll talk about it.” But he never brought the subject up again. I’m very thankful, too. Lynn Brown Jr., recalling a conversation with poet Wallace Stevens while working at Hartford Insurance Group. One thing that has not changed throughout my life is the conviction that the imagination is among the richest gifts life has bestowed upon us. Daily, I wonder if I am still not giving myself enough time to explore this gift. The notion of “genius” too often has been associated with I.Q., but I don’t buy that, and haven’t since I began teaching in 1985. I think genius is one’s courage to trust his/her innate curiosity, and like Emerson, I believe this gift of genius is the “sole estate” of every person. 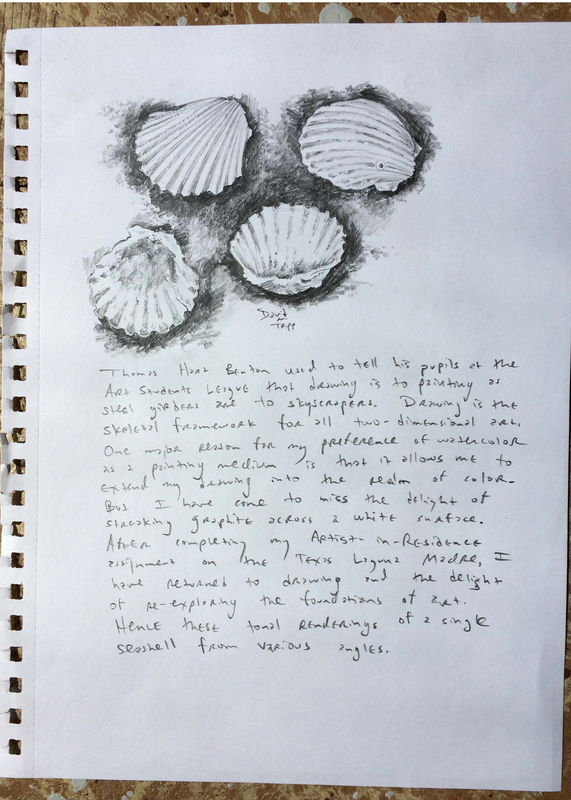 I don’t know what diverted my mind to the sea shells, but while reading, my mind drifted to an abandoned practice that I had once found intriguing in the early 1990’s–back then I used to experiment with several different pencils when layering textures of the bark of winter trees. I decided to try this out on the sea shell. 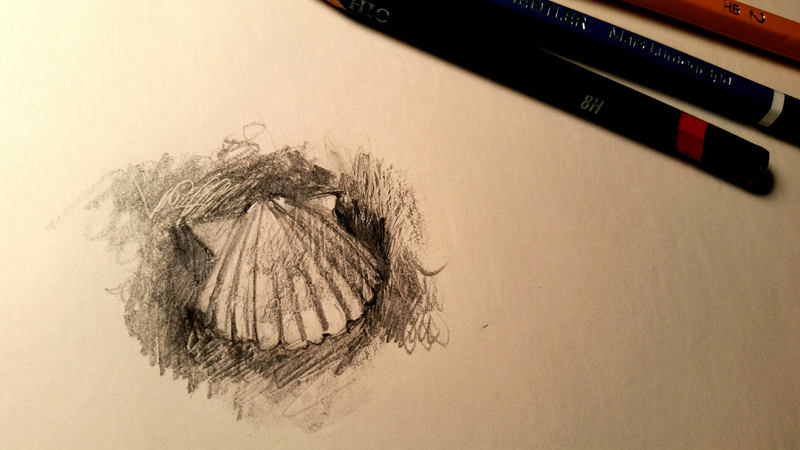 Positioning a desk lamp close to the shell, and placing it on a dark wooden box, I looked at the shell closely and tried to draw it with my usual HB pencil. After getting the basic contours down, I then decided to use a hard, sharp 8H pencil to cut into the drawing paper, and then skate over the top of the scribbles with a soft 6B pencil. The impressions from the hard pencil showed beneath the darkened smears of the soft one, and what emerged reminded me of some of the effects I admire so much in etchings and engravings from Renaissance and Neo-Classical works. This is my first attempt, and now I am excited to try it some more. I am feeling like the mad scientist in his laboratory, late at night. Aesthetics is for me like ornithology must be for the birds.
. . . all that can be said of Friendship, is like botany to flowers. I could not have planned a more gentle morning, sitting in a comfortable chair, reading Thoreau, as the dawn light finally broke through my living room windows. A Week on the Concord and Merrimack Rivers has not been a fast read for me; I began this book years ago, and keep it bookmarked. I thought I would complete my reading at last when I was on assignment in the Texas Laguna Madre. But I still lack about seventy pages before finishing it. The reading of Thoreau’s Journal has certainly cut into my progress over the past few months. I’ve posted the quotes above, because Thoreau’s remark reminded me of something I had gleaned from the painter Barnett Newman years ago, and the sentiments are certainly mine: I have always felt lacking as a theorist, but competent as a practitioner, especially in the realm of the visual arts. I could probably say the same about human relationships–I should be the last one to consult for advice on maintaining successful ones. But that is another story. As I read from Thoreau, my eye drifted to the antique table beside me, strewn with shells and carcasses gathered from my stay on the island last month. 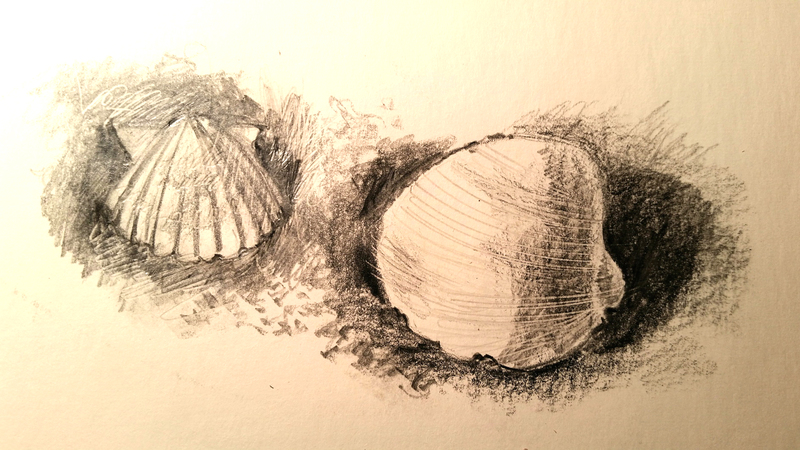 And I realized that I had yet to try and sketch that nickel-sized fiddler crab, though everything else on the table–blue crab, assorted sea shells and Mermaid’s Wine Cup–had been attempted repeatedly over the past month. 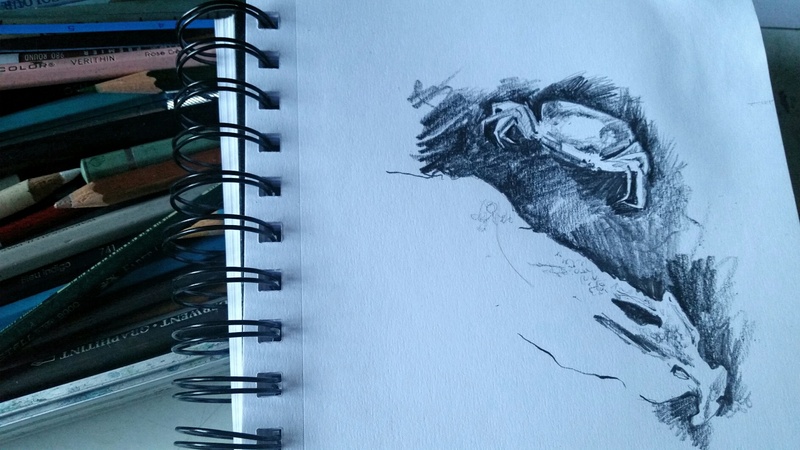 I enjoyed the quiet interlude of sketching, though the creature emerged on the paper, looking like a giant dog tick. The catfish skull proved to be rather challenging as well. Still, the drawing was enjoyable, and as I drew, I continually thought on this notion of aesthetics–what is it exactly that makes visual art attractive? What is it that holds the viewer’s attention, giving rise to some kind of emotional response? I still flounder in the midst of those questions, like a child treading water in the deep end of the pool, on the edge of panic. I feel comfortable with the elements and principles of design, and many of those are intuitive with me, emerging naturally as I draw and paint. Composition just seems to happen organically as I work (feeling that I am actually at play). But aesthetics still cripples me, when it comes to articulating what is pleasing about art. I’m just glad it doesn’t hinder me from making art, and certainly does not diminish my joy in the process. Still, I wish I could sit in some kind of Parisian Cafe setting and hear other artistic spirits talking over these matters. I love solitude, but crave conversation in areas such as this. Thanks to comments from my blogging friend Tony, and encouragement from Dinah Bowman, I’ve decided to explore further the possibility of sketchbook/journal art, allowing my thoughts to nestle alongside the images I attempt to draw and paint. For decades, this is how my mind has operated when imagination forms words and pictures. And yet, I can recall only Leonardo da Vinci among the artists who combined his sketchbook with his journals, the words meandering around and into his drawn images. For a number of years as an art teacher in public schools, I tried to establish this practice among my students, without success, as far as I could determine. A couple of years ago, a very gifted pair of twins in my A.P. Art History class daily sketched and wrote out their ideas in Moleskine journals, and seeing them do that inspired me to do it, from time to time, but not with consistency. Funny–I’ve had no problem maintaining journals and blogs without a break, but the sketchbook aspect just never seemed to stick with me. At any rate, I did buy a sketchbook a few weeks ago, when my last Moleskine journal was completely filled. And I have done more drawing in this sketchbook, though I frequently tear out the pages (hence the one posted above). I am determined to find my way in this endeavor. My blogging friend Tony wrote, asking if I had the three pages presented in an earlier blog prepared for posting and reading. I did not. But a phone call to Dinah resulted in her sending me the images via email (she lives eight hours away, and now has my Laguna Madre portfolio for framing) and I am all-too-happy to post them this morning, Thank you for asking, Tony. These are for you. And Dinah, Tony and I both thank you for taking the time to photograph and send these. 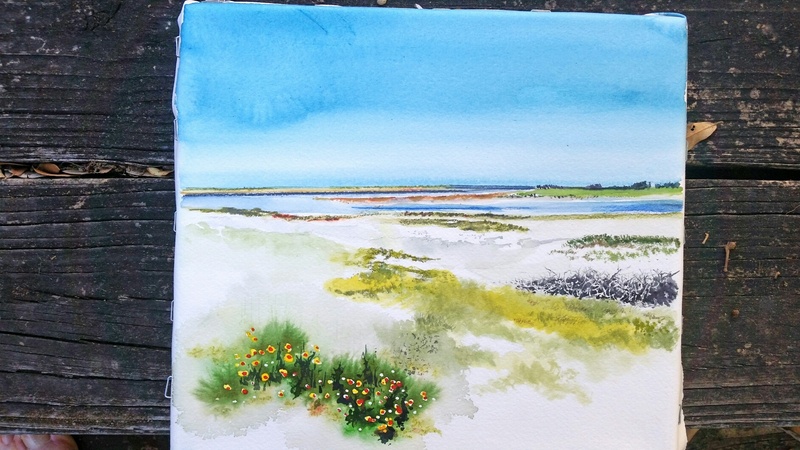 This is the very first watercolor I attempted while on the island in the Laguna Madre. Once completed, I disliked it, thinking it far too pale and devoid of contrast. Nevertheless, it was the first, and has been selected to be in my show this coming October. I like Dinah’s idea of adding my journal entry to the bottom. The plan is to float this watercolor sketch/journal entry in a frame, instead of cropping it with a mat as one would with a traditional watercolor. 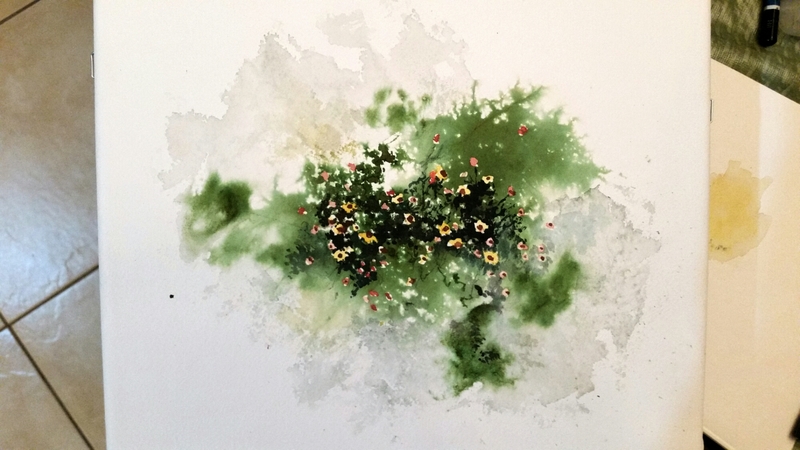 This was watercolor number four, completed at the end of the first day of my island stay. Currently, the plan is to float this one in the frame as well, leaving the crimped edges with the staple holes showing (I had this one stretched over canvas stretchers while painting it). When I stopped painting it (the evening had arrived and the light vanished) there was a considerable amount of negative area occupying the top half of the surface, and my idea was that it could nevertheless be cropped and matted, and presented as a vignette with a halo of light around the borders. Dinah suggested that I insert my journal entry onto this one as well–one of many reasons I am so glad for my obsessive/compulsive habit of keeping journals. I have an interview later this morning with a free-lance journalist. He wants to write a column for the September issue of Arlington Today magazine about my Artist-in-Residence experience. This has been a gift that keeps on giving, and I am so thrilled at everyone who has reached out to me, allowing me to share this story. 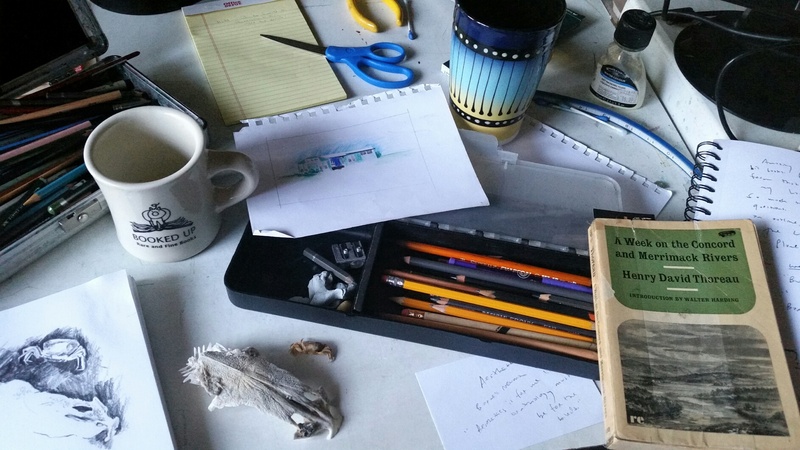 Daily, I am writing and revising my materials covering this Artist-in-Residency, hoping that a book could emerge. I have only published articles in magazines, but never wrote or illustrated an actual book. Now I am hoping I can carry out such a project, and as I proceed, I am looking for ways to combine my writing, drawing and painting into an acceptable art form. I thank you, my readers, for all your positive comments that encourage me to stay on this path. Having completed my eight-hour drive from Corpus Christi, back to my home in the metroplex, I am exhausted to the bone, but still need to pull together some ideas while they are fresh for tomorrow night’s presentation. 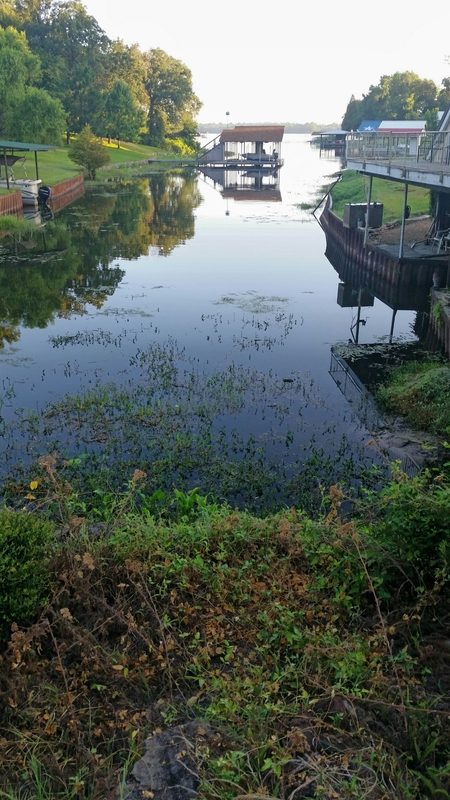 I am a proud member of a Salon that meets monthly to discuss ideas, and tomorrow evening I will be sharing my experiences as Artist-in-Residence on the Texas Laguna Madre. I have known about this engagement for over a month and have composted a number of approaches to presenting this experience, but I am still making changes. 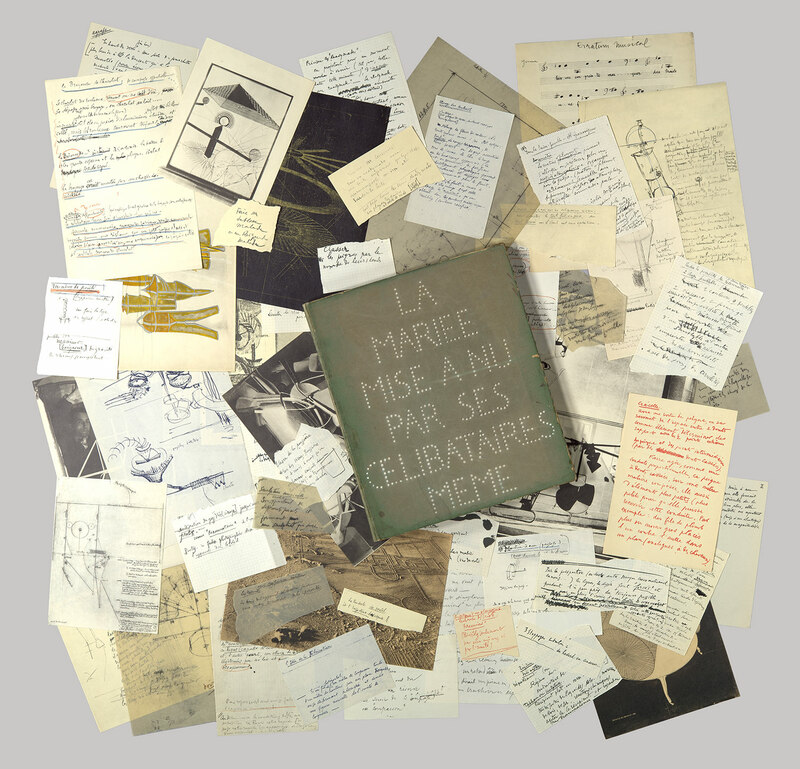 For over twenty years, I have been fascinated with Marcel Duchamp’s nine-foot tall installation, titled The Bride Stripped Bare By Her Bachelors, Even (The Large Glass). He worked on this piece from 1915-1923, before bringing it out for public viewing. In 1934, he made available ninety-three pages of notes and illustrations, showing the workings of his mind as he put this piece of art together. Titling it The Green Box, he wished it be a verbal complement to the imagery in his sculpture. On May 6, exactly one month before I was to being my Artist-in-Residence assignment, I began my own “Green Box” and in the ensuing weeks stuffed a manila file folder full of my writings, musings and sketches of the island project that lay before me. I am currently thinking of sharing some of these ideas with the Salon tomorrow night, as well as the images of the paintings I just took to Corpus Christi yesterday for the one-man-show. I wish I could write more tonight, but my eyes are closing. It’s been a long, weary travel day, and there is so much to do tomorrow. All poets and heroes, like Memnon, are the children of Aurora, and emit their music at sunrise. To him whose elastic and vigourous thought keeps pace with the sun, the day is a perpetual morning. 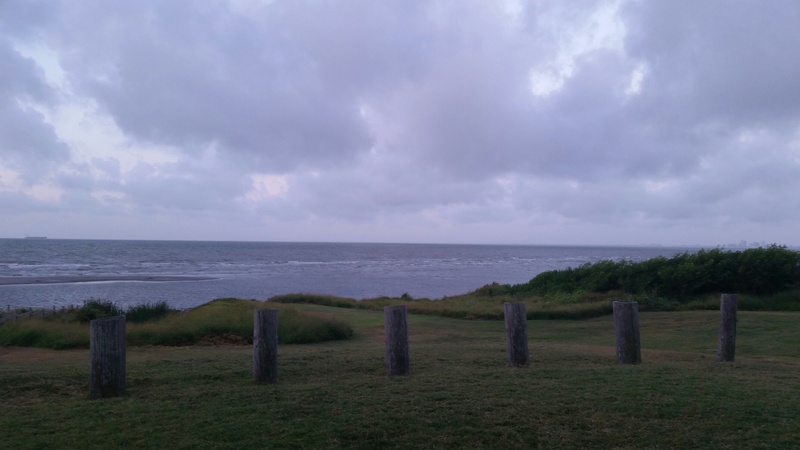 I knew today was going to be a full and busy one, but set my alarm for 6:00 a.m. so I could walk to the Gulf and look over the waters before sunrise. I took this quiet opportunity to scribble in my journal and read from Thoreau’s A Week on the Concord and Merrimack Rivers. The hour proved to be a perfect beginning to what would become a very satisfying day. Lately I have given much thought to how we as humans are a driven race, whether we are striving for wealth, attention, intellectual growth–we tend to push and push and push. Reading Thoreau haunts me, because I perceive in him a quiet soul, a soothing kind of presence. I think there is much we could learn from him. When I get back home, I may need to pull some volumes from my shelf and revisit some of the ancient Indian, Japanese and Chinese writings I have collected, but haven’t read in quite a number of years. 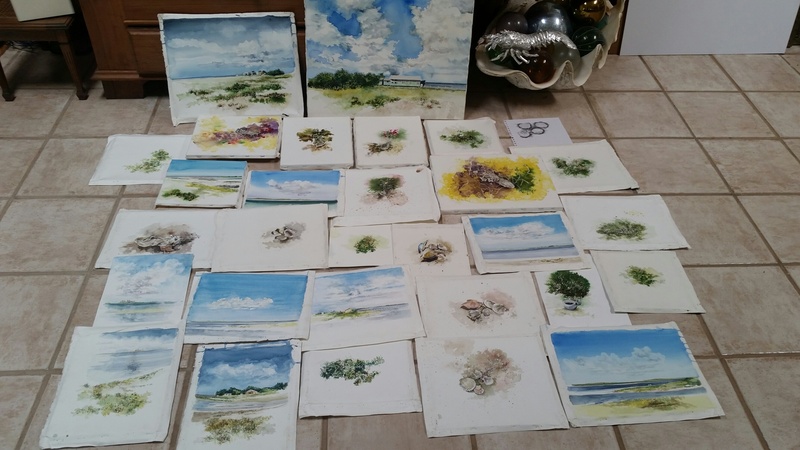 Returning to the house in Portland where I am staying as a guest, I laid out my portfolio to see one more time this collection of thirty paintings and drawings of the Laguna Madre. Nineteen of them were done on site, the remaining ones in my studio after the residency. I am happy that the entire collection was chosen for the show which will tentaively run the last three weeks in October at the Texas A&M University Corpus Christi library. A second, larger show will follow in March at The Art Center of Corpus Christi. I will be scrambling to add works to that show, as this upcoming show has claimed 100% of the paintings and drawings completed up till now. But I am more than happy to rise to this challenge. 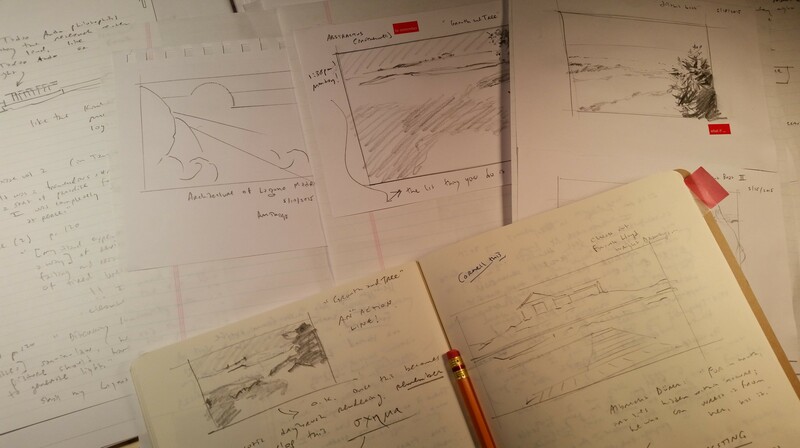 After we made decisions on matting and framing the collection, Dinah Bowman made a suggestion that I have longed to do for years: selecting three of my pieces (two watercolors and a drawing) she asked that I write in pencil a journal or blog entry on the pieces, in the negative areas. She will then frame them with the texts showing along with the art work. She wishes that my show emphasize that I journaled and blogged, in addition to painting, and that these disciplines fed off each other while I was on the island. I have never had the guts to frame and display pieces combining images and texts, and am delighted at her suggestion. 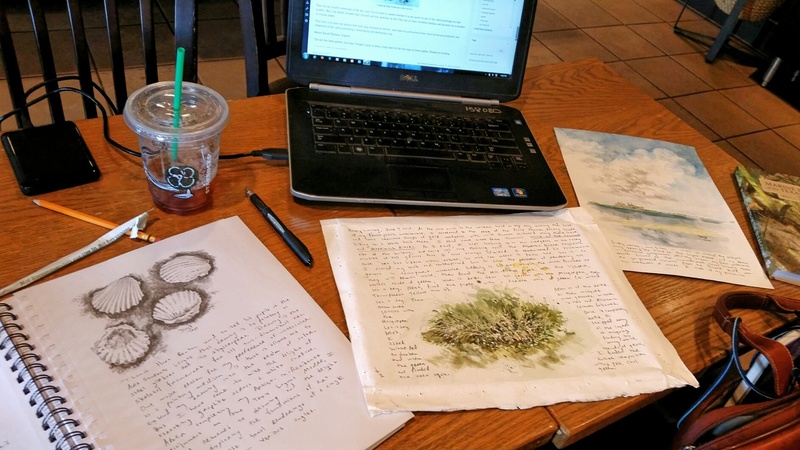 Traveling to a nearby Starbucks for an iced coffee, I spent the rest of the afternoon drafting my entries, and then writing them on the three pieces. The day has been long, but invigorating. I’m delighted to engage in this level of creative business in the Corpus Christi community. Yes, roam far, grasp life and conquer it, learn much and live. Your fetters are knocked off; you are really free. . . . Do not repose every night as villagers do. The noble life is continuous and unintermitting. At least, live with a longer radius. Having driven great distances the past couple of days, it was nice today to sleep in, and then relax into the day. Saturdays are nice for that. 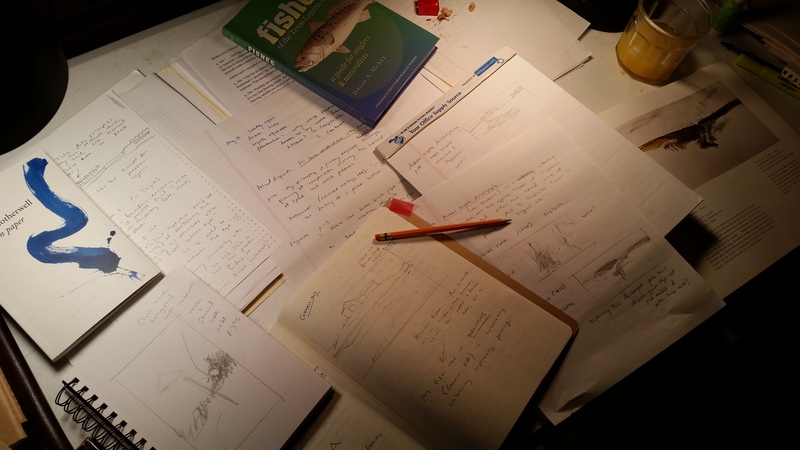 I devoted hours to going over my Laguna Madre papers, watercolor sketches, and digital photos. 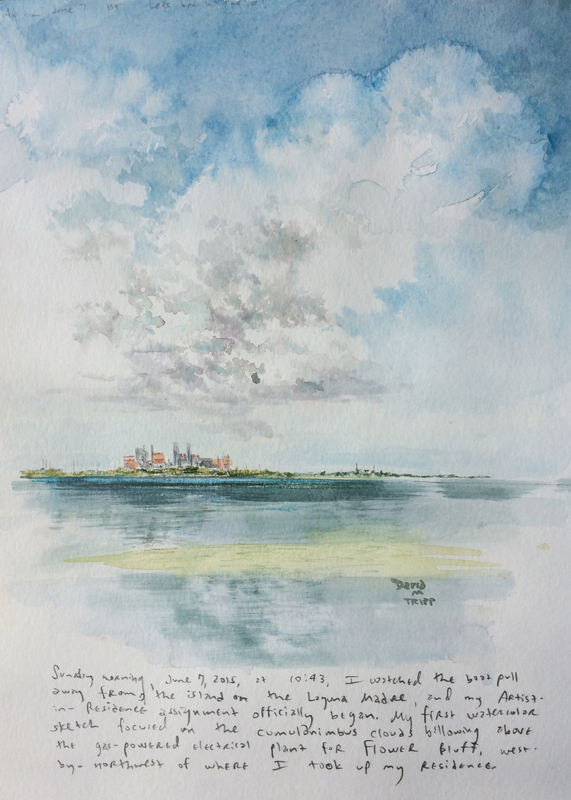 Delicious memories flooded my soul, and as I lingered over some of the photos I had taken of the lagoon, I decided on impulse to stretch a sheet of 9 x 10″ 140 lb. cold press paper and see what I could do inside such a small surface. I have posted today’s work/play. I have some ideas of what to do to tighten it up, but I think I’m going to let it rest a few days. I felt such warm feelings and memories as I worked on this piece, and I’ll remain grateful to my last breath for those six days of splendor on the island. I close my eyes, and I am back there again. There is talk of a plein air painting camp to be held on that island next year, and I would do nothing to miss out on that. I am just dying to see that heavenly environment again. I took Thoreau’s challenge seriously. I am not comfortable, working on small watercolors, to begin with. I’m still trying to solve the problems of horizons such as this, where land masses and lagoon zig-zag in patterns I’ve never attempted to paint before. I love looking at the stacked bands of color, from sky, to trees, to ground, to sand, to lagoon, and then land again. Depth perspective still deals me fits as I try to render flowers in the foreground and gradually shift to middle ground and then background. So much still to learn, but I’m anxious to grow into this. Thoreau challenges me to strive onward and enlarge my circle of understanding. Perhaps I will be better in the classroom as I continually remember that I myself will always be a student. The mythologies, those vestiges of ancient poems, the world’s inheritance, still reflecting some of their original hues, like the fragments of clouds tinted by the departed sun, the wreck of poems, a retrospect as [of] the loftiest fames,–what survives of oldest fame,–some fragment will still float into the latest summer day and ally this hour to the morning of creation. Long ago, on a late-night television talk show, I recall a host asking his guest why he spent so much time with the obscure hobby that he was presenting that night. His answer I’ll never forget: “For those who don’t know, no explanation is possible. 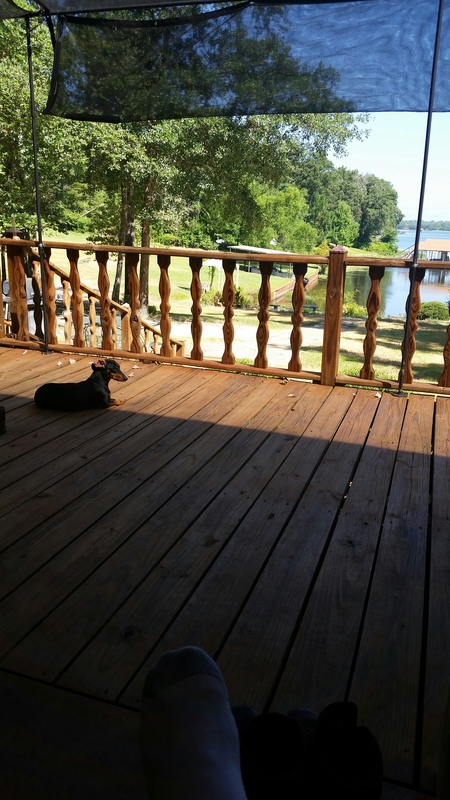 For those who do, no explanation is necessary.” I post that remark, because I am surprised, and gratified, that there are those of you who take time to read my blog, and some of you check it out daily. Thank you. A couple of decades ago, I was filled with a youthful arrogance convinced that everything I thought and said was publishable, and should be heard/read by multitudes. I stopped thinking that years ago, and today find myself surprised to find anyone interested in my daily musings. I am still shocked at the remembrance of “media day” when I was on the Texas Laguna Madre. I saw nine people approaching in a boat with cameras. “Really?” I thought. I’m just a guy painting on the island every day. I’m boring. There is no story here. And still I am very, very pleased, and gratified, that they found the work fascinating that day. And to this day, none of those people who showed up that day has a clue as to how they filled me with a sense of pride and good will. I still look at the videos they edited and read the articles they published, almost daily. Good day to all of you. Texas temperatures outside are soaring toward their appointed mark of 100 degrees. 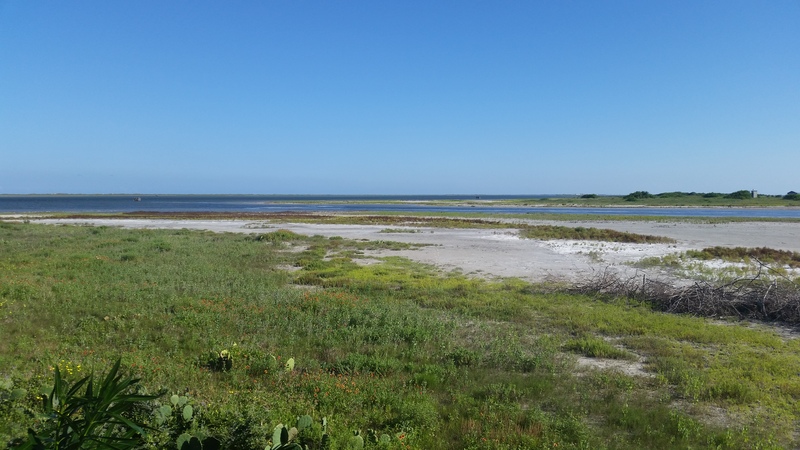 I have chosen to remain inside a darkened, air-conditioned studio to pore over pages of scattered thoughts and sketches scribbled in the weeks leading up to my time spent on the island in the Texas Laguna Madre. I have a 9 x 10″ stretched piece of watercolor paper sitting outside drying in the sun. Soon I’ll be watercolor sketching a small vignette of a piece of the Laguna Madre that I photographed and have been staring at on my computer most of the morning. Thoreau is turning into the best of comrades. His journal entries from the Walden Pond years are really stunning me, particulalry the one posted above. For years I have felt shudders running through me while translating two lines from a Presocratic fragment, or gazing at a shard of an Attic Greek krater, or looking at the angles of what remained from a shattered Greek temple from the Doric ages. Thoreau is right–like color filling the clouds of a sun that has already departed, there is a Presence that flickers in these artifacts, and throughout each day on the island, I shuddered while looking on the beauty of my surroundings in that exotic place. And today, as I look back over my notes and sketches from those days, I feel my soul returning to that sacred place. Time to paint! Thanks for reading. I paint in order to remember (and today I do remember). I had learned from a Walter Harding lecture that Thoreau had first experienced Walden Pond as a five year old. This morning I finally came across these words while reading his Journal and enjoying my time at lakeside. I’ve been so busy with painting this summer that this quiet respite has brought soothing thoughts to my soul. Rising at 6:00 this morning, I wandered along the shores of this east Texas lake waking to 70-degree temperatures, working my fly rod. I did not manage to interest any fish along the way, and regretfully, don’t even remember the last time I landed a fish. That speaks poorly of me, how seldom I get out with a fly rod these past years. I’ll have to fix that. The Thoreau Journal however, was a nice catch. And now it is he who has hooked me. At 7:24 a.m., the lake is quiet except for the sounds of birds in full chorus, and I plan to take advantage of this quality environment.